— 1798: Barton Warren Stone is ordained a Presbyterian minister. He serves churches in Cane Ridge and Concord, Kentucky, outside of Lexington. — 1801: Between 10,000 and 20,000 people from Baptist, Methodist, and Presbyterian groups attend the Cane Ridge Revival, a revivalistic, sacramental camp meeting. — 1803–1804: Stone and others are censured by the Synod of Kentucky and withdraw to form the Springfield (Ohio) Presbytery on September 12, 1803. In June 1804 they voluntarily dissolve the presbytery with “The Last Will and Testament of the Springfield Presbytery,” expressing a desire to “sink into union with the Body of Christ at large.” They seek to preserve the right of churches to call their own ministers and read the Bible for themselves, as well as the unity of all professing Christians. — 1807: Thomas Campbell, Presbyterian minister, weary of the spirit of religious strife in Ireland, arrives in Philadelphia and begins serving churches in western Pennsylvania. He is soon censured for encouraging competing Presbyterian groups to share communion. He urges a return to the New Testament alone for the basis of union among Christians. — 1809: Thomas Campbell and supporters establish the Christian Association of Washington, Pennsylvania, as a way for any and all professing Christians to cooperate in preaching, worship, and communion. Campbell publishes the Declaration and Address of the Christian Association of Washington, widely held to be the founding document of the Campbell movement. When his family arrives from Scotland in September, his son Alexander eagerly joins Thomas’s efforts. — 1810: The Presbyterians refuse to recognize the Campbells and the Christian Association. They form a local church at Brush Run, Pennsylvania, and adopt a congregational polity. 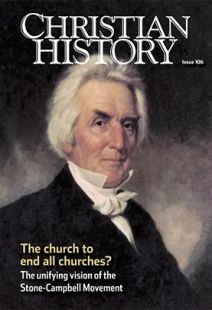 — 1823–1830: Alexander Campbell publishes the Christian Baptist. — 1826–1844: Barton Stone edits and publishes the Christian Messenger. — 1830–1870: Alexander Campbell publishes the Millennial Harbinger. — 1849: The first national convention is held at Cincinnati, Ohio, where the American Christian Missionary Society (ACMS) is formed. This gives a sense of structure to the radically congregational movement. — 1861, 1863: Southern leaders criticize the ACMS when it passes pro-Union resolutions. — 1866: Isaac Errett begins publication of the Christian Standard in Cincinnati, Ohio. This paper is still published and represents the positions of the Christian Churches/Churches of Christ. — 1874:Christian Women’s Board of Missions is organized. — 1875: Foreign Christian Missionary Society is organized. — 1888/9: Clara Hale Babcock is first woman ordained to preach in the tradition. — 1889: Daniel Sommer and other conservative northern Disciples call for separation from congregations that support the use of instrumental music and missionary societies. Their Sand Creek Address and Declaration intentionally plays off Thomas Campbell’s Declaration and Address. — 1906: Conservative “a capella” group (meaning “without instruments”) is officially recognized as a distinct church in the 1906 Census of Religious Bodies. —1909: Centennial Convention, celebrating the 100thanniversary of the publication of the Declaration and Address, is held in Pittsburgh, Pennsylvania. — 1919: Three missionary societies merge into the United Christian Missionary Society.Some moderates resist this move, foreshadowing further division. — 1927: First North American Christian Convention is held among moderates and becomes one of the markers of the second great division in the movement. An annual meeting emphasizing preaching, teaching, and fellowship, it continues today. — 1930: The World Convention of Churches of Christ is established to provide a global forum for Christians in all streams of the movement to worship together and network for ministry. — 1947: The Christian Standard publishes the “Honor Roll of the Faithful,” a list of conservative congregations. — 1952: Churches of Christ begin national evangelistic radio and (eventually) television program, Herald of Truth. — 1955: Conservative Disciples publish the first Directory of the Ministry, still the best way to determine which stream a minister or congregation belongs to. — 1960:The United Christian Missionary Society authorizes the Commission on Brotherhood Restructure. — 1968:The International Convention of the Christian Churches (Disciples of Christ) approves the Restructure and becomes the Christian Church (Disciples of Christ). Though denominational in structure, organization, and ministry, it also retains a strong congregational streak. Its biannual General Assembly does not speak for the Disciples, rather it speaks to the Disciples. — 1971: Christian Churches/Churches of Christ is listed as a distinct group for the first time in the Yearbook of American Churches. — 1996: Disciples form common Global Ministries Boardwith members of another denomination entirely, the United Church of Christ (one with roots in the same radical commitment to being “just Christian” that birthed the Stone-Campbell movement). — 2009: Great Communion Celebration marks the bicentennial of the Declaration and Address, celebrated worldwide by members of all streams of the movement. —2013: Stone-Campbell Movement has 7,400,000 members worldwide.